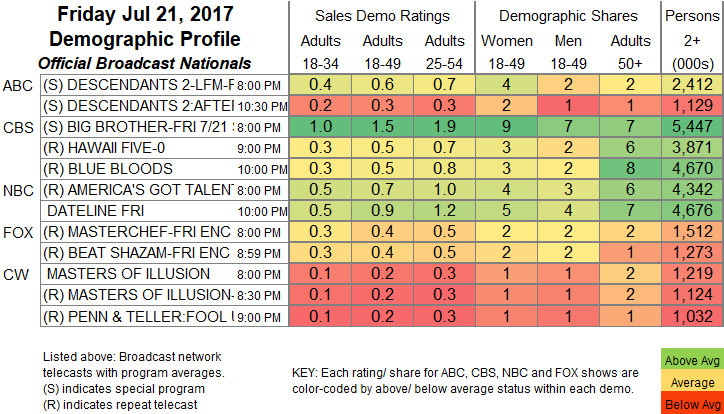 NETWORK FINALS: ABC’s telecast of DESCENDANTS 2 had a healthy 0.2 bump to 0.6 in final numbers. In addition, BIG BROTHER gained 0.1, while the rerun of AMERICA’S GOT TALENT lost the same. 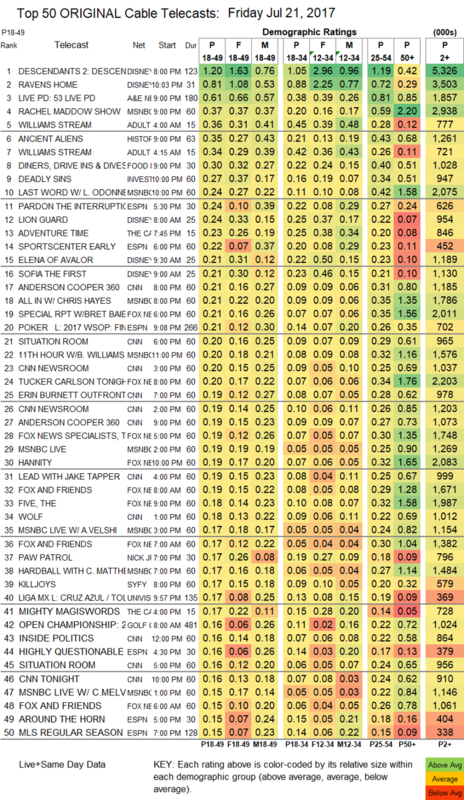 Off the Disney beat, A&E’s LIVE PD rose 0.04 from last Friday to 0.61. MSNBC’s RACHEL MADDOW SHOW dominated cable news at 0.37/2.9M, over CNN’s ANDERSON cOOPER 360 at 0.21/1.2M and Fox News’s SPECIAL REPORT at 0.21/2M. Adult Swim’s segments of WILLIAMS STREAM were at 0.36/0.34, compared to last week’s 0.34/0.31. History’s ANCIENT ALIENS jumped 0.14 to 0.35. Food Network’s DINERS, DRIVE-INS & DIVES climbed 0.02 to 0.30. On ID, DEADLY SINS gained 0.02 to 0.27. ESPN’s WORLD SERIES OF POKER coverage was at 0.21. On Syfy, KILLJOYS was steady at 0.17, DARK MATTER fell 0.04 to 0.11, and WYNONNA EARP was down 0.03 to 0.10. We’s KENDRA ON TOP was at 0.13/0.11, compared to last week’s 0.15.